Functional pain disorders and syndromes like fibromyalgia, IBS, chronic pain, most low back pain, etc. are responsive to suggestion and hypnosis. In this two-week webinar we will demonstrate 5 specific hypnotic processes that can be used to control and even eliminate functional pain. And have a chance to not only learn these techniques, but experience them. In three hours Richard Nongard and Michael Ellner will change the way you practice medical hypnosis forever – and your clients will report success where other professionals have failed. Micheal Ellner is one of the nations foremost experts on hypnotic pain control, and has been in practice in New York City for over 30 years. Richard Nongard is a licensed psychotherapist and clinical hypntoherapist with experience in both inpatient and outpatient medical settings. REGISTER TODAY! THIS CLASS WILL BE FULL and Only 25 participants will be allowed to attend these sessions. Are You Going to Ace That Exam? It depends on your state of mind! Recent research linked stress hormones dependent upon the student’s frame of mind when taking an exam to a student’s high or low performance. This finding is consistent with Alan Barsky and my extensive experience in helping people study and take tests more effectively. We have found that teaching people how to self-induce a relaxed and highly focused state of mind is the “secret” ingredient for improving one’s study habits and test taking skills/abilities. In fact, teaching people how to self-induce a target state of calm confidence, relaxed concentration and physical ease, floods their bodies with positive stress chemicals which automatically promotes peak performance. This is the not-so-secret ingredient in Mr. Barsky and my formula for studying more effectively and acing exams. 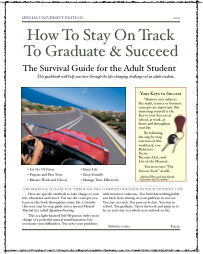 Our new book, “HOW TO STAY ON TRACK: The Survival Guide for the Adult Student”, is a guided, self-help tool for developing one’s creative stress management skills and abilities while learning how to self-induce and function within deeply relaxed and highly focused states of mind that we call “Quantum Focusing”. More great news! Although, the focus of this article is on how “Quantum Focusing” can be a very powerful way to improve your study and exam taking skills/abilities, learning how to self-induce and function in deeply relaxed and highly focused states of mind can enhance just about every area of our lives! And there is so much more! In addition to teaching people how to self-induce and function within a deeply relaxed and highly focused state of mind, our new book offers readers a selection of mental exercises that can help them take advantage of these enhanced states of being. We have included “recipes” for helping our readers feel better, heal faster and generally be more effective in all areas of their lives. The key to performing at your highest levels when studying and taking exams is learning how to do this within your “Success Zone”. Your “Success Zone” is an imaginary oasis in the mist of the all the demands on your attention and time. The great news is that when you are enjoying what you are doing you will automatically be more effective when you are doing it. This is especially true when studying and taking exams because learning (and remembering what you learned on demand) is state dependent. From there, learning to trust your memory is easy! Preparing for your self-empowerment journey begins with learning our basic QUANTUM FOCUSING™ exercise. Start by using this powerful conditioning exercise. The QUANTUM FOCUSING™ exercise below is an example of just how easy it is to unwind, recharge and refocus your attention. Hint: You are in a different state of mind when you are looking for rabbits, horses or faces in the clouds than when you are deciding whether a cloud is cumulus or cirrus. Creative stress management and positive imagery are most effective when you are playful! Experience what happens when you do this 2-minute basic “Relax and Recharge” exercise several times a day for a few days. 1. Become comfortable with your surroundings, not focusing on anything in particular as you allow your attention to glide into doing this exercise. 2. Without thinking about it, gently bring your attention to just “being” inside your body. 3. Fill your mind with a sense of occupying all of the space from the bottom of your feet to the top of your head. Imagine every cell in your body dancing in total harmony. 4. Say to yourself, “I work and play with a happy heart, a peaceful mind, and a playful spirit.” Stay with it for about 30 seconds, personally feeling your studying is more exciting and rewarding after using one of these POSITIVE mind games! “The world is a better and happier place when I am peaceful and relaxed!”. 6. As you exhale, take a moment to feel complete and good about what you just did. 7. Bring yourself back into the moment, focusing your attention on what you are doing. It’s interesting that research has shown it is not necessary to visit a meditative state for lengthy periods in order to achieve a calmer state. Our brief, yet effective, approach requires only a few minutes of your time and can be utilized anywhere. One way to get the most of your studies is to induce your “Success Zone”, quickly review your notes in your mind and then quickly rewrite them without consulting the originals. Now compare both sets of notes. Doing so is a great way to discipline your mind and learn to trust your memory. You can do this and our new book can help! Alan Barsky and I utilized this understanding as the foundation of our book for Adults who are continuing their educations. We believe that learning how to creatively manage stress can make a difference between success and failure in just about every area of our lives. Ever wonder why two people who are faced with the same stressful situation can react so differently? Why one may fall apart under the stress while the other is spurred on to greater achievement, invigorated rather than incapacitated by the challenge it presents? The difference lies in their internal connections. For example, most people react automatically to current situations or problems based on deeply held beliefs, expectations and/or preconditioned responses rooted in their childhood “template”. The great news is that self-hypnosis can help us to learn to make better “connections” both internally and externally, better connections between a potential stressor and the outcome it leads to. By the way, some of the confusion about stress stems from the way different researchers use the word. It is often meant to apply to outer events (e.g., getting fired, a death in the family, a change in a relationship) and inner events (e.g., heartbeat speeding up, adrenaline pumping, depression of the immune system). Technically speaking though, the word “stress” refers to the internal events and the word “stressor” refers to the external events. Hypnosis addresses “stress”; it acts upon the machinery of our background template, the “inner connections” that govern the inner stress response; it activates and helps reorganize into a more integrated state the different stressor-negotiating mechanisms and their associated physiology. This is helpful of course because we cannot do much, if anything, about certain outside events. In today’s economy, people are being fired every day. People are losing their homes and long-term relationships are ending. But, on the other side of the coin, by working with certified hypnosis professional and/or practicing self-hypnosis and meditating we can do something about our internal reaction to these events so we can deal with the external events more efficaciously. Instead of feeling pressured, we can sense an excitement. Instead of feeling anxious or afraid, we can sense practical action and confidence. Once these re-connections are in place and operating automatically, i.e., once our internal representations of what each stressor means are in place and operating automatically, we can feel challenged by stressful situations rather than threatened by them. Here is a link to the PR/News item.